Revelation 2:7(KJV); He that hath an ear, let him hear what the Spirit saith unto the churches; To him that overcometh will I give to eat of the TREE OF LIFE, which is in the midst of the paradise of God. When the evil one came to Eve in the Garden of Eden, he gave her a vision that caused her to behold certain things about the tree of the knowledge of good and evil. The Bible says that she saw that the tree was good for food; she saw that the tree was pleasant to the eyes; she saw that it could make one wise (Genesis 3:6). If there was a vision cast with effect to the tree of the knowledge of good and evil, there is undoubtedly a vision to see when one beholds the TREE OF LIFE. This was Christ’s mandate in the New Testament. His part is to give you a vision of what happens when you eat of the TREE OF LIFE. The Bible says that the leaves of the tree were for the healing of the nations (Revelation 22:2). 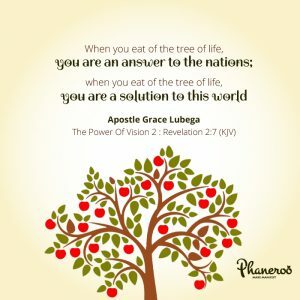 When you eat of the tree of life, you are an answer to the nations; when you eat of the tree of life, you are a solution to this world. Hallelujah! PRAYER: Dear God, I thank you for this Word. I am a carrier of life because I partook Christ, the tree of life. My fruit changes the world around me; my fruit is an answer to my nation; my fruit is healing to what I touch. In Jesus’ name. Amen.